As our staple helicopter tour, we’ll take you on an entire lap around scenic Block Island. There’s simply no better view of Block Island as you enjoy the Mohegan Bluffs, Southeast Lighthouse, New Shoreham downtown, and the Great Salt Pond. With spectacular landscapes and crystal clear water, you’ll make memories that will last a lifetime. With the Offshore Wind Experience Helicopter Tour, not only will we show you a stunning aerial view Block Island, but we’ll give you a once in a lifetime view of the only offshore wind-farm in North America. Towering nearly 500′ above the water, there is simply no better way to see the Deepwater Wind Facility than from our helicopters. If you’re looking for the ultimate Block Island Experience, this is the helicopter tour for you. 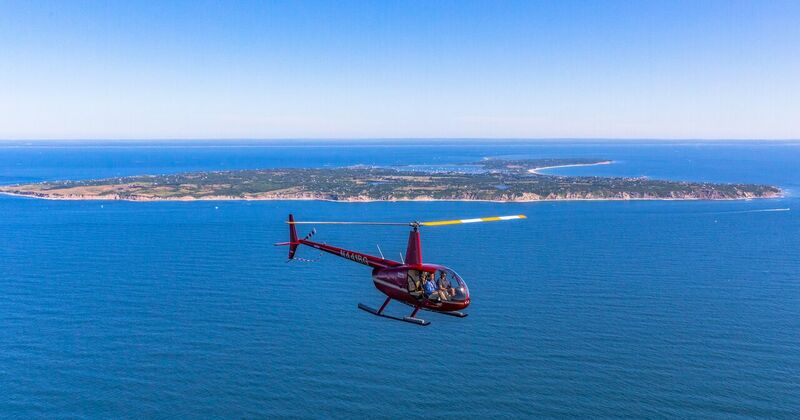 We’ll not only show you everything from our Block Island and Offshore Wind experience, but you’ll feel the rush of low-level flight on the first lap before climbing to 2,000 ft to enjoy a beautiful aerial view of Block Island, Montauk, Fishers Island, Newport, and even Martha’s Vineyard on a clear day.